It's hot inside the cramped Department of Natural Resources lab room in Aitkin. The odor of putrefied fish is thick enough to cut with a fillet knife, but the smell doesn't bother fisheries specialist Brian Beyerl. "The batteries in the air freshener died a month ago," he says while squinting at a tiny, scythe-shaped bone he tweezed from bile-colored goo inside a dissected walleye stomach. The bone, called a cleithrum, can be used to identify the species of fish it once belonged to, and this one has him stumped at the moment. Mille Lacs isn't the only large walleye lake that has weathered tough times. In the mid-1990s, the walleye fishery at Red Lake collapsed due to overfishing by tribal netters and state anglers. Though fisheries managers believed Red Lake's walleye would have come back on their own, they used aggressive stocking to help speed the recovery, according to DNR Fisheries section chief Don Pereira. Around 2003 the Leech Lake walleye population began to decline. In 2005 a decision was made to begin reducing the number of fish-eating cormorants around the lake. Walleye fry were also stocked, mostly to satisfy a public demand for it, says Pereira. Today, both Red and Leech lakes have healthy walleye populations. Minnesota's large walleye lakes are resilient. Because Mille Lacs Lake has adequate numbers of spawning walleye, Pereira says conserving those fish is the DNR's priority as it works to recover the lake's walleye population. Additionally, a panel of fisheries experts is reviewing decades of data collected at the lake. "If we want to say that our management is science-based, then we need to be open to having it scrutinized by our professional peers before it is all finalized," says Pereira. "A fresh set of eyes, particularly from internationally renowned experts, will be useful as we seek an optimal management plan for the future." Read the panel's recommendations, which were made public on Jan. 16 at the DNR's Fisheries Roundtable. Learn more about DNR efforts to improve Mille Lacs Lake's walleye fishery. "You want to call it an unknown?" asks DNR fisheries biologist Tyler Ahrenstorff. He's teasing Beyerl, who reminds Ahrenstorff that he doesn't give up easily. Intern Michael McMahon knows the routine and hands Beyerl a ring-bound stack of laminated cleithrum images. After a minute of close comparison, Beyerl determines the bone belongs to a burbot. This native cold-water species is no longer common in the waters where this fish became a meal. Ahrenstorff records the unusual find next to a more common prey item, which was less digested and easy to recognize as a perch. The burbot, the perch, and the walleye that ate them came from the southeastern corner of Mille Lacs Lake, where we had spent a July morning using gill nets to haul in northern pike, smallmouth bass, and walleye. The work was part of a two-year study examining the diets of these three species—the most abundant predators in the 132,500-acre lake in central Minnesota. The research, led by Ahrenstorff, was prompted by a troubling trend: Plenty of walleye hatch in Mille Lacs each spring, but not enough survive to adulthood. Why? Are they being eaten? In October, after sorting through the stomach contents of some 3,000 walleye, 1,000 northern pike, and 500 smallmouth bass, Ahrenstorff found that the lake's three main predators do consume a share of the lake's juvenile walleye. However, he says, "It is not the only, and perhaps not even the most important, factor influencing the survival of young walleye." Changes—such as clearer water, invasive species, and a warming climate—may be affecting Mille Lacs Lake's ability to sustain as many walleye as it once did. In the communities that surround Mille Lacs, the economic importance of walleye is hard to miss. The town of Isle has a walleye painted on the water tower. A walleye is printed on the flag of the local newspaper. A statue of the state fish watches over Main Street. Hang around long enough and you'll discover the jargon of fisheries biologists is part of the local vernacular. At cafes and bars, resorts and boat ramps, one might hear talk of year-classes and recruitment. Year-class refers to all the walleye that hatched during a particular spring. If a walleye survives three years in Mille Lacs, it will have grown to a length of roughly 13 inches. At that size, natural mortality from predation sharply declines, and the fish is considered recruited into the population. When a lot of walleye hatch, it's considered good reproduction. If a high percentage of those walleye survive to age 3, a good year-class has been recruited. When several good year-classes are present, the result is a surplus of fish. In a perfect world, people enjoy some of that surplus, and enough is left to replace what has been depleted from other year-classes. But Mille Lacs is big and complex. Just a two-hour drive from the Twin Cities, Mille Lacs also attracts a lot of anglers, and its walleye are always in high demand. During an average year, state-licensed anglers collectively spend more than 3 million hours trying to hook walleye. During peak years, some 500,000 pounds of this species end up in frying pans. In 1992 anglers hauled a record 1.2 million pounds of walleye from Mille Lacs. Since 1997, in response to a federal court ruling to uphold the rights of eight Ojibwe bands to harvest fish from Mille Lacs, an annual cap has been placed on the number of pounds of walleye that can be taken from the lake. That cap, known as the safe harvest level, averaged 460,000 pounds through 2013. For the 2014 season, the harvest level was slashed to 60,000 pounds because the walleye population had declined more than 50 percent since 2008. Mille Lacs Lake's popularity rises and falls with its walleye population, but its status as the most studied lake in the state is uncontested. Since the 1980s, intensive monitoring, long-term research, and novel research, such as Ahrenstorff's, have been directed at ensuring a sustainable walleye fishery. All of it involves sophisticated statistical models. But in basic terms, recruitment is like revenue. Natural mortality and harvest are like expenses. The current problem with the lake's walleye is a lack of revenue. Poor recruitment is making it difficult to restore one cornerstone of the fishery's health: a good distribution of walleye of all sizes and ages. From the mid-1990s to present, the population of male walleye dropped, according to DNR regional treaty coordinator Tom Jones. The magnitude of the change, he acknowledges, was an unforeseen consequence of both state angling regulations and tribal netting, which focused harvest on small, predominantly male walleye. During the same period, the lake's population of large female fish increased but has since started to decline. The glut of large female walleye drove reproduction up to record levels, but those offspring have been disappearing long before they might end up in a livewell or a tribal gill net. Are the lake's growing populations of smallmouth bass and northern pike to blame? The answer, according to Ahrenstorff's research, is mostly no. He found that the lake's smallmouth bass eat very few walleye. Smallmouth eat some perch but dine mostly on crayfish and small fish species such as madtom and slimy sculpin. Northern pike eat juvenile walleye, and in 2014 they ate quite a few. "But there aren't that many pike in the lake," Ahrenstorff says, "so it doesn't really make up a big proportion in the grand scheme of things." Ahrenstorff discovered that an individual walleye eats about as many juvenile walleye as a pike does. An estimated 50,000 pike longer than 20 inches ply the waters of Mille Lacs. But because the lake holds many times more walleye, the biggest predator of juvenile walleye is the walleye. Ahrenstorff's research, which is in the field of bioenergetics, essentially looks at how much food is consumed in the lake and which species eats the most of it. After two years of carefully examining, measuring, and weighing stomach contents of walleye, northern pike, and bass, Ahrenstorff was able to calculate that walleye ate 90 percent of all the food eaten by the three species. Northern pike accounted for 8 percent, and the lake's smallmouth bass ate only 2 percent. What bioenergetics research can't do is determine whether or not the lake has enough food to sustain all its fish populations. 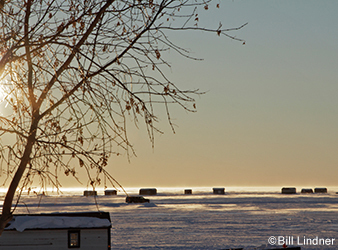 Mille Lacs has all of the physical attributes of a walleye factory. It has diverse habitat that provides ideal cover for prey fish and clean, rocky shorelines for walleye to spawn. The lake's vast open waters harbor tullibee—a high-calorie fish and a staple for big walleye. Slightly murky water is another characteristic of an ideal walleye lake. But in the mid-1990s, the lake's water began to get clearer. This was likely the result of improvements to septic systems around the lake, following passage of the Clean Water Act in 1972. Walleye do well in low-light conditions, and better clarity might give a competitive advantage to the lake's other predators such as northern pike. Clearer water has also allowed invasive Eurasian watermilfoil to grow in new places, providing more ambush cover for pike. The change in clarity also points to a decrease in algae, or phytoplankton, a fundamental ingredient for producing lots of walleye. These small one-celled plants provide food for tiny critters known as zooplankton. Small fish, in turn, eat zooplankton. "If you have enough algae, it can reproduce faster than the zooplankton eat it," Jones explains. "And if enough zooplankton are produced, they can reproduce faster than the little fish eat them. And when that happens, you're going to have lots of little fish." In 2005 Jones discovered invasive zebra mussels in Mille Lacs. Since then, he has studied their spread and estimates the lake may now contain some 2.5 billion pounds. Collectively, the tiny mussels filter large amounts of water, which depletes phytoplankton and the nutrients it relies on. This means less food for zooplankton. More bad news for the backbone of Mille Lacs' food chain arrived in 2009 with the discovery of spiny water fleas. This large invasive zooplankton eats native zooplankton, leaving less to go around for the lake's larval fish including yellow perch, the walleye's primary prey. According to Ahrenstorff's research, yellow perch account for 50 percent of a walleye's diet in Mille Lacs. Invasive species and warmer waters also threaten tullibees—the second most important prey item for walleye. Like burbot, tullibees depend on cold water to survive. During extended warm spells, large die-offs of tullibees occur on Mille Lacs. Trends such as later ice-up and earlier ice-out suggest the climate is warming, which could further stress the tullibee population, according to Jones. The good news, says Jones, is that "given the right conditions, Mille Lacs' walleye population can recover pretty quickly." He points to the lake's last population low in 2004. "In 2008 we had recruitment, and the population almost doubled," he says. "If we can get some year-classes to recruit, then the population could increase in a hurry." Twenty years ago Oneida Lake, a popular walleye fishery in upstate New York, went through changes similar to those on Mille Lacs. Between 1990 and 1998, Oneida's water got clearer as a result of an infestation of zebra and quagga mussels, according to Lars Gosta Rudstam, a fisheries researcher at Cornell University. Consequently, the walleye population declined. Restrictive fishing regulations, along with reductions in the number of fish-eating cormorants, helped Oneida's walleye fishery improve. Today, Rudstam estimates, Oneida supports about two-thirds as many walleye as it once did. Whether the recovery of walleye on Mille Lacs will be diminished by the presence of invasive species and a warming climate can't be predicted. The priority at Mille Lacs, says Jones, is protecting the lake's current walleye population. Beginning in 2013, the DNR reduced the walleye limit to two fish between 18 and 20 inches with one over 28 inches allowed. Until some year-classes recruit into the population and a healthier age distribution of walleye returns, he says anglers can expect similarly tight slot and bag limits. "We need to protect the little fish coming into the system," says Jones, who notes that the Great Lakes Indian Fish and Wildlife Commission agrees with the DNR's assessment. In 2013 the commission recommended that band members spear more fish instead of relying entirely on gill nets, according to Jones. "Netting tends to focus the harvest on spawning males, which can be as small as 15 inches. Spearing spreads the harvest out over more of the population," says Jones. "So both sides are trying to shift their harvest to include more fish that are bigger and older." Jones emphasizes, "Our plan is for Mille Lacs to always be a good walleye lake. Our goal is to keep our walleye population as strong as conditions will allow. That's what we're after." In the short term, meeting that goal may mean less traffic around Mille Lacs. On the sunny July day when I met Ahrenstorff, the Isle Bay public access was unusually quiet. A pair of anglers at the dock was trying to coax a cold-blooded outboard into starting. They paused to ask Ahrenstorff some questions, which he answered in a practiced manner, filling in the details and purpose of his research. "I hope you guys find some answers," said the captain of the fishing boat before the stubborn outboard revved to life. "Of course, we wish we could keep a few. But hey, it's a beautiful day, and we're going out anyway."